BlackBerry 8820 hits Warehouses; Pearl 2 Coming Soon? From the BoyGenius comes word that AT&T is taking delivery of BlackBerry 8820 units at warehouses across the United States. But the fireworks that should be going off have been muted as AT&T doesn't want to get stuck with a ton of unsold BlackBerry 8800s. Don't expect to see the 8820 in your local outlet until they run out of 8800's first. You can't really blame AT&T for wanting to keep the rollout of the 8820 on the DL. With the BlackBerry 8820 becoming available, who's going to want to buy an 8800? No Wi-Fi? No Thanks! 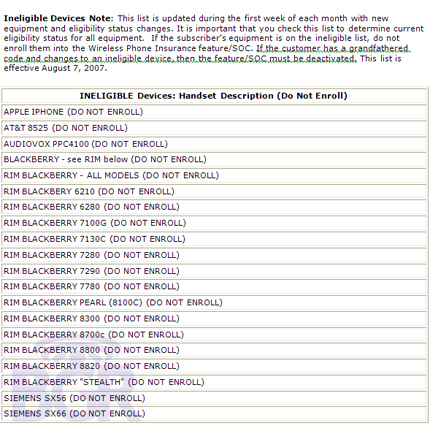 Rumor also has it that the BlackBerry 8820 will be exclusive to AT&T. Wow - the iPhone, BlackBery 8300, and now the BlackBerry 8820... all exclusive. That is one powerful company! At least its guaranteed the blogosphere has ruined AT&Ts supposed hopes for a quiet launch of the new device! I'm sure AT&T customer service will be getting a ton of calls for the new BlackBerry 8820 today! What now has me curious has to do with the image above - what oh what is the BlackBerry "Stealth"? That was an old nickname for the Pearl. Could this be the Pearl 2? !